There may not be a director in Hollywood on a better winning streak than Denis Villeneuve in my book. After delivering two great films over the last two years (Prisoners in 2013 and Enemy in 2014), it’s safe to say Sicario was high on my most anticipated list. Add in some stellar leading names and one of the best cinematographers of all time and you may just have a winner. Kate Macer (Emily Blunt), an FBI agent quickly rising through the ranks, receives a top assignment to assist in taking down a large cartel. Recruited by a mysterious, and slightly sleazy, government official named Matt Graver (Josh Brolin), Kate joins up with a task force for the escalating drug war. 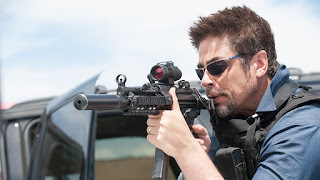 Leading the team is the intense figure Alejandro (Benicio Del Toro) as the task force attempts to use a big fish in the cartel game to catch an even bigger one down the line. The opening scene of the film completely sets the tone for the remainder of the film. Its darker aspects only continue throughout, perhaps getting worse and worse. But what makes it even better is Villeneuve’s idea to have Kate basically be the audience. Everything she experiences is something you as an audience member can feel yourself. Kate serves as our gateway into the world of Sicario, and it works magnificently throughout the runtime. While Kate might serve as the viewpoint for the audience, the movie truly belongs to the character of Alejandro. Of course Emily Blunt is fantastic in her role and if it weren’t for Del Toro she would absolutely be getting more attention. Josh Brolin brings it as well as the cowboy-like government guy who is likeable despite some of his actions. But in this film Benicio Del Toro brings his absolute A game and is the actor that will receive award conversation when the time comes. In his role as the mysterious and shadowy character, Benicio delivers a spine tingling performance at times and certainly steals the show in each of his scenes. Besides the performances, Sicario is amazing to watch. Roger Deakins is a cinematography genius. The scenes throughout the film are shot so masterfully that it’d be a shock if Sicario doesn’t get nominated for the Oscar for Best Cinematography. And there is Denis Villenueve, who continues to impress with his directing skills. He gets fantastic performances out of the main three actors and manages to build suspense unlike any film I’ve seen in 2015. These two, who are so wonderful at what they do, elevate the relatively simple story into something great. So what did you think of Sicario? Have you seen it, are you interested in seeing it? Comment below and let me know and remember to return to I Am Sam Reviews for weekly reviews and insight.